Throughout the Urban Meyer era at Ohio State, the Michigan State game is commonly one of the most difficult games on the schedule, and 2018 portends to be in line with the previous contests. Of course, Ohio State has made this specific game with Michigan State even more challenging to predict, with the Buckeyes sporting an inconsistent running game and a defensive scheme that has routinely allowed big plays to their opposition. It will be cold, and it might not look too great, but here are three areas I will be focused upon when Ohio State and Michigan State kick off at 12pm on FOX. Dotson only has 10 receptions for 108 yards and 1 touchdown this season, so you may be wondering why I am concerned. The aforementioned defensive lapses, plain and simple. With a linebacker corps that has not distinguished themselves this season and safeties who have not been much better, with the exception of last week’s game by Brendon White versus Nebraska, it seems like Dotson may have opportunities to exploit the Buckeye defense on Saturday afternoon. Will L.J. Scott Hurt Ohio State Once Again? L.J. Scott has been hurt most of the 2018 season, not playing in last week’s game versus Maryland. 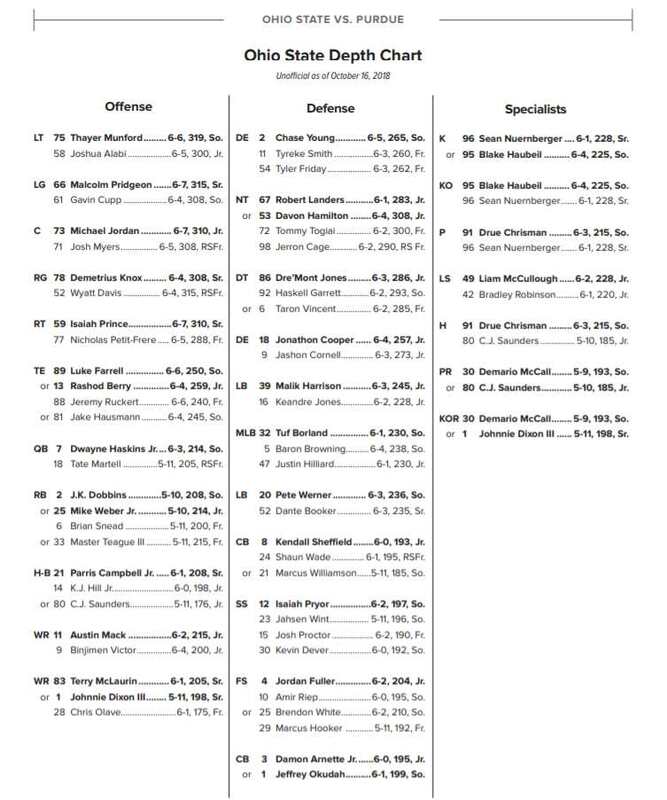 In 2016, Scott had a big game against the Buckeyes, and Scott has been listed as the starter on the depth chart for this game. Again, this is going to be a crucial test for the Ohio State linebackers, no matter if Scott plays, or if Michigan State decides to go with Connor Heyward. Ohio State seemed to figure out how to run effectively last week against Nebraska, but Michigan State is much better defensively than the Cornhuskers. Ohio State was able to rush for 229 yards against Nebraska. Michigan State is leading The B1G in rush defense, only giving up about 72 yards per game. One of the key players in the Spartan defense is linebacker Joe Bachie, a native of Ohio who was not offered a scholarship by the Buckeyes. The leading tackler for the Spartans, Bachie is coming off a week versus Maryland that saw him earn The B1G Defensive Player Of The Week. Joe Bachie was named the B1G Defensive Player of the Week for the 3rd time in his career after helping lead MSU past Maryland 24-3 . He forced 3 fumbles, recovering 1, and also had 7 tackles, 2 tackles for loss (5 yards) and 2 pass break-ups. Congrats @JoeBach35 !! Bachie forcing 3 fumbles is a huge concern if the ‘Huskers can force six from the Buckeyes. Very good point. I am always leery of Michigan State, especially because of the high number of Ohio players on their roster who may/do feel they have something to prove to Ohio State, and Bachie is one of them. Thanks for the comments. Here’s 3 things you won’t see,the young Fast linebackers getting a shot,Tate Martell getting a chance,and Haskins running for a first down! That’s a good idea for another article, “Three Things Not To Watch For”. Hoping you and Calibuck are both mistaken. And Sasquatch is usually seen in the Pacific Northwest, I believe…Thanks for the comments.